A large number of congresses, seminars and conferences are now held ​​all over the world. Unfortunately, these events have a variety of negative effects on the environment. The United Nations Program for the Environment (UNEP) has published guidelines to reduce these effects and we will follow them in organizing the seventh WEEC. Making events like the WEEC greener is a significant and tangible contribution in the pursuit of sustainability. Each meeting or conference has a negative impact on the environment (increased ecological footprint). Examples are transport, air conditioning, the documents provided to the participants, food and accommodation. All of this consumption of natural resources (energy, water and paper) produces waste and contributes to air and water pollution locally and globally, as well as having an impact on climate change through the emission of greenhouse gases. A sustainable event is designed and constructed to reduce consumption, to mitigate the social and environmental impact and to leave a positive mark on the host community. 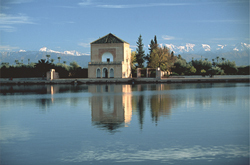 The venue for this Congress will be the Congress Palace of Marrakech, which is conveniently located to hotels and the city centre and can be reached on foot or by means of public transport. The organizers are responsible for encouraging the use of renewable energy, natural light or energy-saving lamps, and solar battery chargers for computers and mobile phones. The selected hotels must satisfy specific requirements. The hotels must be near the congress centre and the downtown area. In addition, they must be easy to reach on foot or by public transport, which is essential for keeping transport emissions to a minimum. Whenever possible, preference is given to hotels that are eco-certified (Green Key, Eco Label Europa, etc.) and / or that adopt energy-saving practices and other environmental procedures (like changing linens and towels only when requested); that engage in reducing wastage (water) and refuse (e. g., using local and more sustainable products rather than disposables); and that have appropriate systems for waste collection, sorting and recycling. When choosing the catering services, special attention is given to the environmental impact of the food and beverages themselves, which can vary according to what is being proposed, and how the products are prepared. Preference is given to local and seasonal products, encouraging the use of organic and / or fair-trade foods and healthy nutrition. It is important to ensure that the caterer knows the exact number of participants ahead of time so as to reduce waste and that any excess food be donated to a local community organization. The consumption of foods and beverages can generate large quantities of paper, plastic and other organic wastes. We recommend using tap water, avoiding the use of disposable articles and reducing the amount of packaging. We also recommend making provisions for collecting and recycling products throughout the entire event. Before the event: communication with the participants and registration. 1 – Communication with participants will be done by email so they can be downloaded and read on the screen (for brief, small-sized documents like invitations, announcements, etc.). 2 –Participants will be able to register online. During the event, paper use should be kept to a minimum (recycled paper, made in Morocco and printed on both sides). The use of electronic devices such as USB drives or CD-ROM should be encouraged, and, if possible, computers with Internet connection should be made available to the participants. The posters and support panels will be made of materials having the least environmental impact possible. 3 – Advertising materials and other products for the participants will be kept to a minimum and made locally (i.e. bags for delegates, posters, gadgets, etc.). The products must also be made of sustainable, organic or recycled materials. In terms of greenhouse gas emissions, transport has the greatest effect on an international event. Therefore, particular attention is devoted to this topic so as to minimize its impact. The calculator allows you to calculate the amount of carbon dioxide emitted during the journey, transforming it into a financial contribution, and to choose the project for CO2 reduction that you want to support (development of renewable energy, planting trees, etc.). 1 – Installing photovoltaic solar kits for illumination and the operation of small appliances in 142 rural schools and in the homes of teachers located in vulnerable regions of Morocco. 2 – Planting 7,000 date palms in the Palmeraie of Marrakech, 2400 (about 12 hectares) of which are irrigated by solar powered drip irrigation system. 3 - Distributing 500 bicycles to students of schools and universities located in the Palmeraie of Marrakech, as a way to raise awareness among students about the greenhouse effect and climate change. Educational guides and posters have been published and provided to the 230 eco-schools belonging to the program that the Foundation realizes in collaboration with the Ministry of Public Instruction. The proximity and accessibility of the main places of the event (congress centre, hotels, downtown area and access to public transport) is a priority for reducing the distance. Participants should travel on foot or by public transport. To this end, appropriate information such as maps and bus schedules will be made available to participants. Bike rentals will be promoted (details to follow later). Participants travelling by car are urged to compensate for the CO2 emissions generated by their journey (see point 5 above). Air transport is most responsible for CO2 emissions. Since it cannot be avoided, it should be compensated for (see point 5 above). Exhibitors are encouraged to reduce the amount of material available in the stands. All materials must be as sustainable as possible in accordance with the provisions provided. Rather than using high-intensity energy in the stands, exhibitors are asked to limit the lighting and energy needs. Setting up the stands produces a considerable amount of refuse (e.g. packaging for the materials to prepare the stand) and the display material themselves (posters, etc.). Therefore, the exhibitors are urged to follow the local rules for waste collection and should be encouraged to reuse any documentation and materials.